RRD Fire Ride is a fast all-round windsurfing board and offers pretty god planning abilities even if boards like Tabou Rocket and Exocet Sting is a bit quicker onto the plane. 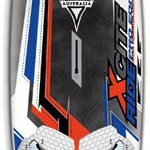 RRD Fire Ride is a really good carver that will appeal to the beginner as well as the more advanced rider. Are you looking for even more speed the RRD Fire Race could be an alternative, but then you lose a bit of the RRD Fire Rides maneuverability and easygoing abilities / performance. The RRD Fireride is not the most stable board while it accelerates, but the inboard footstrap setting is one of the easiest for progressional riders to get into once up and planing. The top speed is considerably faster in the outboard straps, but they aren’t placed out and back enough to match the fastest boards in the test. To plane fully through a jibe the RRD Fireride prefers to be carved with full speed in a modern hips-in style that commits your weight forward over the board. The RRD Fireride is a great freeride board for recreational riders who are aggressive in their desire to learn. It rewards hard work with style and the RRD Fireride is a board that they’ll be able to grow into for years to come. True recreational speedsters should look at the RRD Firerace models, instead of the RRD Fireride, to meet their slalom needs. When you get the RRD Fire Ride 120 on the water it instantly feels like a performance board. In a straight line there’s no doubting that the RRD Fire Ride is fast. In gybes the RRD Fire Ride is really nice for both advanced and beginner styles. Advanced gybers will be able to drive the RRD Fire Ride hard and tight through the turn. Beginner / improver gybers will appreciate the extra stability and control the RRD Fire Ride offers through the turn, particularly compared to the livelier Fanatic Hawk and Starboard Carve. The RRD Fire Ride is a board that will suit a wide range of freeride sailors. The nose and shoulders ride low, which gives very good control at the top end but make the RRD Fire Ride more suited to flatter water.